Daniel Jacobs has vowed to beat Saul 'Canelo' Alvarez and prove he is the best middleweight in world boxing. IBF champion Jacobs (35-2-KO29) meets Alvarez (50-1-2-KO34) in a titanic showdown at the T-Mobile Arena in Las Vegas, live and exclusive on Sky Sports, on May 4. Jacobs lost a narrow points decision to Gennady Golovkin in his native New York two years ago. But the 'Miracle Man' is confident he can cement his status as one of the best pound-for-pound fighters in the world by beating Canelo with a view to setting up a rematch with Golovkin. "Victory would truly show the fans that whether you think I beat Golovkin or not. I am the best middleweight in the world," Jacobs said. 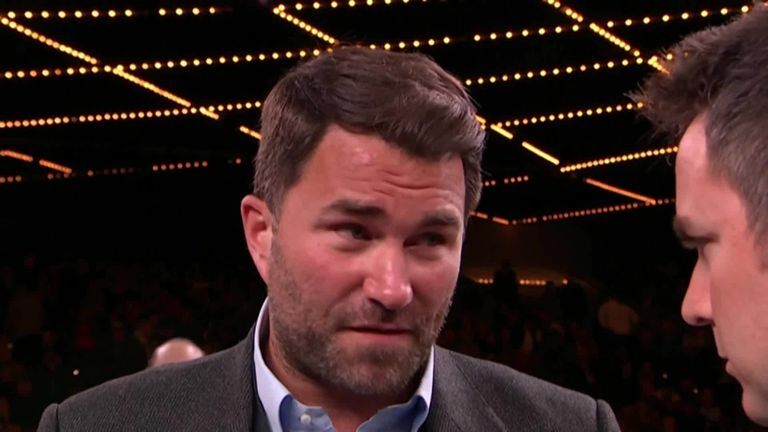 Eddie Hearn loos ahead to Daniel Jacobs' unification clash with Saul 'Canelo' Alvarez on May 4th in Las Vegas. "I've always said that I am the best, and I've also always been vocal that the win over Golovkin was taken from me. "So, a win over Canelo puts a new idea in the fans' minds that this guy is the best as he's proven it against a guy that bean Golovkin - and then I can give Golovkin the rematch and prove that I am better than him." Canelo, who is also the Lineal and Ring Magazine champion at 160lbs, drops back down to middleweight after stopping Liverpool's Rocky Fielding and claiming the WBA super-middleweight title. Jacobs acknowledges Alvarez is a truly great fighter and has promised fight fans a classic as he tries to knock Canelo out and prove he is 'the best gladiator in the world'. "I give Canelo all the respect in the world. He's definitely top-ten, pound-for-pound," Jacobs said. "There are some controversial fights that he's had that where I thought he lost, including both Golovkin fights. "But I respect any man that has the courage to fight as this is a kill or be killed sport, but that's where the respect ends. As far as getting in the ring with him goes, I want to be the victor. "I want to take his head off and prove that I am the best gladiator in the world. That's my true intentions so there's no respect when it comes to that. "But we're both gentlemen and in my opinion, we're great ambassadors for the sport. But take that away, and it's going to be a blood sport in the ring."